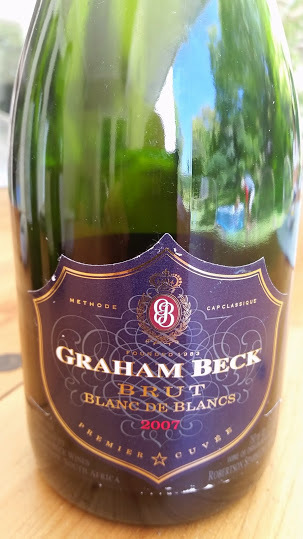 If you like your bubbly lean and racy, then Graham Beck Blanc de Blancs is probably not for you. It’s a rich and creamy style, the fact that 50% of the base wine is fermented in barrel playing an important role in this regard. Yesterday, a bottle of 2007, a wine which has now spent some four years under cork, making for quite lazy but still persistent bubble. On the nose, pronounced brioche but also a subtle marmalade like quality. The palate was full, the acidity not particularly noticeable although you wouldn’t call the wine listless . A most enjoyable way to kick off Sunday lunch.